The average person has 12,000 thoughts per day—most of them a recurring handful of unwelcome distractions. On Still the Mind, master meditation teacher Bodhipaksa offers an essential program for anyone looking to move beyond the chatter of a too-busy mind, while laying the foundation for a daily meditation practice. Two CDs of instruction and guided sitting sessions will help you discover the breath as an untapped source of mental clarity and inner peace, as you transcend the hectic demands of everyday life and learn to settle into the deepest parts of yourself. Bodhipaksa’s gentle teaching style and straightforward delivery take the mystery out of meditation. His step-by-step instruction will help you to cultivate your own daily practice right in the middle of your busy life. 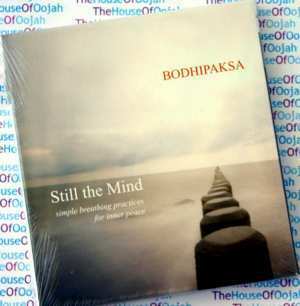 Bodhipaksa is a vegetarian Buddhist author and a member of the Western Buddhist Order. He has published several books including Guided Meditations for Calmness, Awareness, and Love. He has also written Wildmind, Guided Meditations for Busy People and Vegetarianism. He has had writings published in Tricycle Magazine and Dharma Life magazine, as well as in Business Ethics Quarterly's publication, Spiritual Goods: Faith Traditions and the Practice of Business. He is the founder of Wildmind.org, an online meditation resource.